This article seeks to account for the diverse interconnections of processes, motivations, policy, and patterns of migration in Kosovo today. It connects Kosovo empirically with wider theoretical debates on human rights and social work education. The article also explores how past and present migration has informed and shaped policy, placing Kosovo’s system of migration in international human rights law and Europeanization processes, with the requirement to comply with the body of the European Union (EU) law—Acquis Communautaire—as a precondition for Kosovo’s eventual EU membership. It shows how configurations of the relationship between Kosovo and the EU affect migration policy and practices. In addition, this article touches on the connection of migration to social work education. 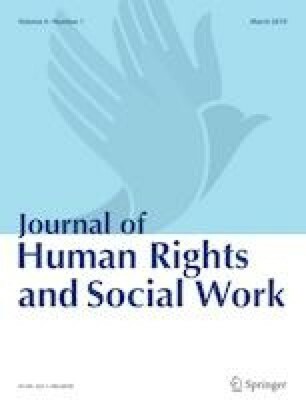 Grounded in a rights-based approach, it argues for the interdependence and indivisibility of human rights applications and the role of social work education in Kosovo, regionally and internationally. Comprehensive Proposal for the Kosovo Status Settlement (2007). Retrieved from http://www.unosek.org/unosek/en/statusproposal.html. Deutche Welle (2016). Kosovo Prime Minister Isa Mustafa confirms his brother sought asylum in Germany. Retrieved from http://www.dw.com/en/kosovo-prime-minister-isa-mustafa-confirms-his-brother-sought-asylum-in-germany/a-19130598. DRC (2009). IDPs from and within Kosovo: vulnerabilities and resources. Retrieved from https://static1.squarespace.com/static/512c8363e4b01fa674942656/t/52fb2971e4b024e798274647/1392191857880/IDPs+from+and+within+Kosovo.pdf. European Commission—Enlargement—Acquis (n.d.) Retrieved from https://ec.europa.eu/neighbourhood-enlargement/policy/glossary/terms/acquis_en. European Commission (2012). Visa liberalization with Kosovo roadmap. Retrieved from https://www.mei-ks.net/repository/docs/visa_liberalisation_with_kosovo_roadmap.pdf. European Stability Initiative (2006). Cutting the lifeline: migration, families and the future of Kosovo, Berlin, Istanbul. Retrieved from http://www.esiweb.org/pdf/esi_document_id_80.pdf. GIZ (2012). Analysis of migration strategies in selected countries: Albania, Armenia, Croatia, Kosovo, Kyrgyzstan, Macedonia, Moldova, Montenegro, Serbia and Tajikistan. Retrieved from https://www.giz.de/fachexpertise/downloads/giz2012-en-analysis-migration-strategies.pdf. Government of Kosovo (2013a). Action plan of national strategy of the Republic of Kosovo on integrated border management. Retrieved from http://www.kryeministri-ks.net/repository/docs/Action_Plan_of_the_Strategy_on_Integrated_Border_Management.pdf. Government of Kosovo (2013b). National strategy on reintegration of repatriated persons in Kosovo and action plan 2013–2017. Retrieved from http://www.kryeministri-ks.net/repository/docs/National_Strategy_for_Reintegration_of_Repatriated_Persons.pdf. Government of Kosovo (2013c). State strategy on migration and action plan 2013–2018. Retrieved from http://www.kryeministri-ks.net/repository/docs/STATE_TRATEGY_ON_MIRGRATION_ACTTION_PLAN_2013-2018.pdf. Government of Kosovo (2017). National strategy for sustainable reintegration of repatriated persons in Kosovo 2018–2022. Retrieved from http://webcache.googleusercontent.com/search?q=cache:vRy3eZxiXjQJ:konsultimet.rks-gov.net/Storage/Consultations/15-46-22-04122017/ANG-Strategjia%2520Komb%25C3%25ABtare%2520per%2520Riintegrimin%2520e%2520Qendrueshem%2520te%2520PR%25202018-2022.doc+&cd=1&hl=en&ct=clnk. Human Rights Watch (1999). Under orders: war crimes in Kosovo. Retrieved from https://www.hrw.org/sites/default/files/reports/Under_Orders_En_Combined.pdf. Kosovo Agency of Statistics. (2014). Kosovan migration. Retrieved from http://kosovo.iom.int/sites/default/files/Migrimet%20English%20FINAL%2013082014.pdf. Kosovo Agency of Statistics (2016). Labour force survey 2016. Retrieved from http://ask.rks-gov.net/media/3245/lfs-2016-anglisht.pdf. Kosovar Centre for Security Studies (2015). Policy brief, migration: challenging visa liberalization for Kosovo. Retrieved from http://www.qkss.org/repository/docs/visa-migration-eng_190914.pdf. Kosovo Assembly (2008a). Constitution of the Republic of Kosovo. Retrieved from http://www.kuvendikosoves.org/common/docs/Constitution_of_the_Republic_of_Kosovo_with_amend.I-XXV_2017.pdf. Kosovo Assembly (2008b). Law no. 03/L-066 on asylum. Retrieved from http://www.assembly-kosova.org/common/docs/ligjet/2008_03-L066_en.pdf. Kosovo Assembly (2010a). Law no. 03/L-171 on diaspora of Kosovo Retrieved from http://www.kuvendikosoves.org/common/docs/ligjet/2010-171-ang.pdf. Kosovo Assembly (2010b). Law No.03/L −208 On readmission. Retrieved from https://www.kuvendikosoves.org/common/docs/ligjet/2010-208-eng.pdf. Kosovo Assembly (2012). Law No.04/L-072 On state border control and surveillance. Retrieved from http://www.kosovopolice.com/repository/docs/Ligji_Nr.04-L-72_per_kontrollin_dhe_mbikeqyrjen_kufirit_shtetror_31.Dhjetor_2011_Anglisht.pdf. Kosovo Assembly (2013a). Law no. 04/L-215 on citizenship of Kosovo. Retrieved from https://www.kuvendikosoves.org/common/docs/ligjet/Law%20on%20Citizenship%20of%20Kosovo.pdf. Kosovo Assembly (2013b). Law no. 04/L-219 law on foreigners. Retrieved from https://www.kuvendikosoves.org/common/docs/ligjet/Law%20on%20foreigners.pdf. Kosovo Assembly (2013c). Law No. 04/L-218 On preventing and combatting trafficking in human beings and protecting victims of trafficking. Retrieved from https://www.kuvendikosoves.org/common/docs/ligjet/Law%20on%20preventing%20and%20combating%20trafficking%20in%20human%20beings.pdf. Kosovo thanks you. (2017. December 18). Retrieved from https://www.kosovothanksyou.com/. Ministry of Interior of Kosovo (2015). Kosova Profili i Migrimit 2015. Retrieved from https://mpb.rks-gov.net/DocumentsShpalljet/Profili%20i%20Migrimit%202015%20-%20Shqip-1.pdf. Ministry of Interior (2015). National strategy against trafficking in human beings in Kosovo 2015–2019. Retrieved from http://www.kryeministri-ks.net/repository/docs/NATIONAL_STRATEGY_AGAINST_TRAFFICKING_IN_HUMAN_BEINGS_IN_KOSOVO.pdf. Ministry of Interior of Kosovo (2013). Kosovo migration profile 2013. Retrieved from https://www.google.com/url?sa=t&rct=j&q=&esrc=s&source=web&cd=1&ved=0ahUKEwimi77QxfzYAhVOyaQKHQmpBdYQFggmMAA&url=https%3A%2F%2Fwww.pragueprocess.eu%2Fen%2Fcomponent%2Fattachments%2Fdownload%2F96&usg=AOvVaw0x2RDV8RlcwAI_qGntsD1w. Ministry of Return and Communities of Kosovo (2013). Strategy for communities and return 2014–2018. Retrieved from http://www.kryeministri-ks.net/repository/docs/STRATEGY_FOR_COMMUNITIES_AND_RETURN_2014-2018.pdf. Organization for Security and Cooperation in Europe (OSCE) (2009). Implementation of the strategy for reintegration of repatriated persons in Kosovo’s municipalities. Retrieved from http://www.osce.org/kosovo/40180?download=true. United Nations (UN) (2017). International migration report 2017. Retrieved from http://www.un.org/en/development/desa/population/migration/publications/migrationreport/docs/MigrationReport2017_Highlights.pdf. United Nations General Assembly (1990). International convention on the protection of the rights of all migrant workers and members of their families (Resolution 45/158). Retrieved from http://www.ohchr.org/EN/ProfessionalInterest/Pages/CMW.aspx. United Nations Human Rights Office for the High Commissioner 2016. Serbia and Kosovo: UN rights expert calls for bold efforts to unlock protracted displacement. Retrieved from http://www.ohchr.org/EN/NewsEvents/Pages/DisplayNews.aspx?NewsID=20514&LangID=E. United Nations Interim Administration Mission in Kosovo (UNMIK) (2005). On the movement of persons into and out of Kosovo (Regulation No. 2005/16). Retrieved from http://www.unmikonline.org/regulations/2005/RE2005_16.pdf. UNDP (2014). Kosovo human development report 2014: migration as a force for development. Retrieved from http://hdr.undp.org/sites/default/files/khdr2014english.pdf. UNDP & USAID (2013). Study on rate of visa rejections in Kosovo: Reducing the Schengen visa rejection rate for Kosovar citizens. Retrieved from https://www.mei-ks.net/repository/docs/AP_on_Visa_eng.pdf.